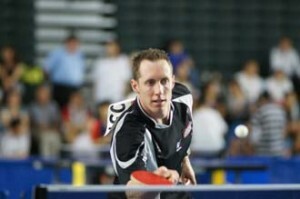 During the last month, I have played four table tennis tournaments. After each competition, I analyze my game in detail about what went right and what went wrong. In this article, I want to share some of my victories and some of my struggles. I was top seed and won this event easily, yet I still learned two things by playing in this tournament. First, my opening loop was too slow. Even though the players couldn’t block it easily and it worked at the lower level, I needed it to be quicker. I needed to train at the higher level even when playing lower players. The second point was my footwork. I needed to make small steps and adjust for each ball, even when the ball landed in nearly the same location. Because I wasn’t making quick steps, I was often off-balance and not consistent enough. After the tournament, I made these two small adjustments and improved my game for the next tournament. A faster opening allowed me to stay closer to the table and win many points with my third-ball-attack or fifth-ball-attack. Small steps allowed me to be in good position for each ball, shift my weight to get more power, and be more consistent in the rallies. The day before the Hock open, I arrived at the tournament site and had a short practice session to adjust myself to the playing conditions. On Saturday, I cruised through my first four matches easily. In the semifinals, I upset Venkat Ramesh. The match went as planned and I didn’t learn much from it. In the final, I lost a big battle to Paulo Rocha. Interestingly, I remember much of this match and really saw three of my major weak points. First, I was unable to stop his third-ball-attack. After serving, he was easily able to counterloop my opening or make a good loop off my push. Because Paulo plays extremely aggressive, I needed to stop his main weapons. The second thing that I noted was that he was able to win most of the long counterlooping rallies. I need to have stronger footwork, keep my balance better, and be more consistent in the rallies that are more than three hits. The last thing I noted was my placement on my power-shots. I would often hit my opponent’s racket instead of playing strategically to the middle or a wide angle. Overall, I was happy with my results at this tournament and drove home motivated to train even harder. I won the Millcreek Open by defeating Dan Seemiller, Randy Seemiller, John Wetzler, and Joey Cochran. Even though I came out victorious, there were plenty of problems with my game at this tournament. Right now, I feel that problems are a good thing. If I’m 2500-level with many mistakes, I’ll be 2600 when I find solutions to my inconsistencies. 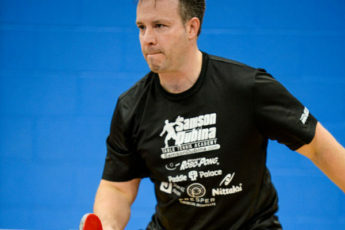 The first problem during the Millcreek Open was my forehand/backhand transition. Because I was leaning and reaching for many balls, I wasn’t able to maintain proper body balance and have a smooth transition from both wings. The second problem was my distance – I was too far from the table. Yes, it gives me more time, but it also allows my opponent more time. In the coming weeks, I’ll be focusing on keeping my distance close and being able to play quick balls. This is especially helpful because I’m not using booster like many of the other top American players which allows them to have added power in the distant counterlooping rallies. My final problem in Erie, was too much blocking, I needed to counterloop more. A 2600 player must have excellent counterlooping skills, this is what I must strive for. Improving these are three key elements that will take me to the next level. The title of this tournament should be consistency, Consistency, CONSISTENCY! Against the players near my level, I was able to make good serves, good returns, and win the rallies. Against Canada’s #1 and #2 players, there were just too consistent in the long rallies. I felt good when making several very nice shots in each game, but I needed 11 points each game to win! While I was able to rally 3-4 hits, they were able to rally 5-6 hits. I felt a good sense of satisfaction from dominating players at my level, but I need to look to the future and step up my game to the next level. Throughout the tournament, my mental game was strong. After each point, I was able to analyze what went right and wrong and make quick adjustments. I was able to stay positive and keep good composure whether winning or losing. As I progress through stage three, I am now seeing better results at tournaments. I have confidence to make solid shots with good placement, even in very close games. I’m winning more 12-10 and 11-9 games now than I have ever won in my life, mainly due to playing many tournaments and feeling more confident in my shots. I’m maintaining my physical conditioning as well as spending much time on the table practicing. My physical conditioning consists primarily of speed drills with shadow strokes, elastic band strokes, speed multiball, and speed robot training. At this point, I don’t want to build muscle, I merely want to increase my foot speed and racket speed. 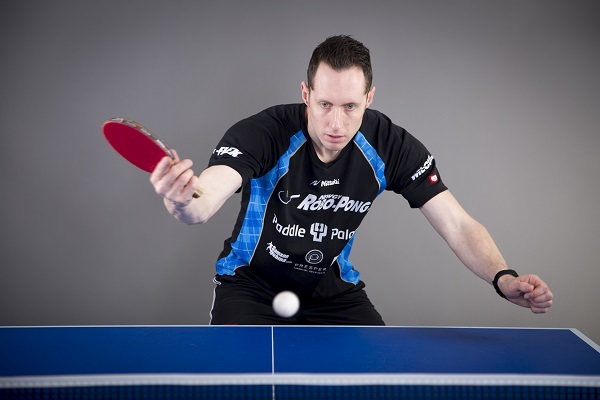 As I begin the fourth stage, (December) I’ll then be focusing exclusively on table tennis. Much of my time then will be spent on serve, serve return, and match play. I plan to play at least fifteen practice matches per week. It’s great to be physically fit, to have strong strokes, to have great footwork, but the key to progressing is combining all of these things in a real game. Matches will help link all of these components together. In addition to practicing on a daily basis, I also plan to compete in some major competitions. My next tournaments include the FIT Open, Highland Open, NA Teams, US Nationals, Quebec Circuit, then finally the Olympic Trials. My goal is to make the US Olympic team – this goal helps to motivate me to train hard every day. Winning is nice; however, character is more important than winning.